Pumps are among the most commonly used machines in the chemical process industries (CPI). Condition monitoring tests and predictive maintenance can help pump operators determine when to overhaul pumps in a way that minimizes costs. Despite pumps’ ubiquity and large energy demands, however, relatively little information is available on how to apply predictive maintenance approaches and condition monitoring to process pumps. Pump overhauls may occur on a fixed time schedule or as a result of a specific breakdown, but neither case necessarily represents the most cost-effective policy. In cases where deterioration in the performance of a centrifugal pump causes a drop in plant production, pump overhaul is readily justified, because the cost of performing the overhaul is usually small compared to the losses from reduced production. However, when pump performance deteriorates due to wear and the only effect is increased power consumption (with no discernable effect on production), the question of when to perform an overhaul becomes important. The right time to overhaul that minimizes cost can be calculated from predictive maintenance test results. The use of condition monitoring methods ensures that pump overhauls aimed at restoring performance are executed when they are actually necessary. This article describes several condition-monitoring tests for pumps, and discusses how to use these predictive-maintenance methods to estimate the increased power consumption that results from pump wear (Figures 1 and 2). 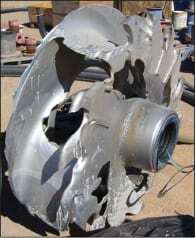 Experience in the field or with an original equipment manufacturer (OEM) may help pump operators determine when to undertake overhauls, but others may not have an idea of how to determine the optimal time, because many pump textbooks, even excellent and widely used ones, have failed to cover the application of condition monitoring to pumps in detail, and information in this area has been lacking until recently [1, 2]. It is hoped that the tools presented in this article will help asset managers and engineers improve management of pump assets to provide capacity for production, as well as improve energy efficiency and minimize greenhouse-gas emissions. Although the article focuses on pumps, the optimization approach described here can also be applied to other plant equipment where deterioration results in efficiency loss, and where energy consumption can be measured or estimated. The extent and specific effects of internal wear in centrifugal pumps vary according to the characteristics of the liquid being pumped, as well as the type of pump and its operating duty. Some pumps last for years, while others last for only months. For critical machinery, the use of more than one method of condition monitoring in combination may be justified. This article demonstrates the use of performance analysis and includes some examples of condition monitoring in practice. An understanding of basic pump performance characteristics is assumed, as is how to measure test data in a repeatable manner. For condition monitoring, repeatability is more important than absolute accuracy. The most useful condition-monitoring method is head-flow measurement, because in addition to pump deterioration, it also detects any changes in system resistance. This method can be used for all pumps where flow (or some repeatable indicator of flow) can be measured. Figure 3 shows the trend in degradation of two pumps over multiple years. The degree of wear is expressed as the percent reduction in total head due to wear, compared with the pump’s new condition, at duty-point flow. This is usually derived from head-flow tests near the duty point, but can also be obtained using the shut-off head test, where this test is allowable. Regular interrogation of the plant historian can be used if a plant has a DCS (distributed control system). Figure 3 (bottom) shows data for a multistage boiler-feed pump (specifically, a constant-speed, four-stage pump; 5,853 rpm; 5,744 kW; 171 kg/s at 20.4 MPa). Data points are extracted every six months from a run of 10 days at a steady load. Throttling the pump over its full flow range to obtain data points is not necessary for monitoring. Several points near the normal operating duty point are sufficient to reveal the effects of wear, usually shown by a shift in the head-flow curve towards the zero-flow axis by an amount equal to the internal leakage flow. A series of test readings at steady conditions, at about 15-s intervals, is sufficient. Average values are plotted. Speed must also be measured for variable-speed pumps, and the head-flow data must be corrected to a standard speed using the affinity laws for pump performance. Field tests sometimes yield results that are slightly different from the manufacturer’s works tests because site conditions for flow and pressure measurement (as required by the various standards for pump testing) are rarely available. It is important to remember that for monitoring, relative changes are more important than absolute accuracy. For condition monitoring, non-intrusive ultrasonic flowmeters are acceptable in many cases. A permanent flowmeter installed as part of a pump’s minimum flow protection or for process measurement can be used, as long as the flowmeter’s long-term condition is considered to be constant. Or, it can be inspected regularly. The shut-off head method can be used for predictive maintenance of pumps. While measuring the head at zero flow is a relatively simple test, it is only possible where it can be tolerated by the pump. This is not the case for high-energy pumps, and for pumps of high specific speed where the power at shutoff is greater than that at the duty point. Pumps have exploded from a buildup of pressure when left running at zero flow. To perform the shut-off head test, read the suction and discharge pressures (when steady) with the discharge valve closed fully for no longer than 30 s or so. To convert the pressure readings into head values, the liquid temperature is also needed to determine the density. Wear on the outer diameters of pump vanes will show readily, because the head-flow curve of a worn pump shifts toward the zero-flow axis. To show wear of the sealing ring, the pump head-flow curve needs to be relatively steep. (Note that if the pump has a rising head-flow curve, internal leakage will initially give rise to an increase in shut-off head). Another method of pump monitoring is to measure the temperature rise of the liquid through the pump. This measurement is a reflection of the inefficiency of the pump. Because the differential temperature is small, great care is required to measure it. For example, effects of recirculation at the pump inlet and outlet must be eliminated and thermodynamic tests are not possible at low or zero flow. Pump efficiency can be calculated from the measured data of inlet temperature, the differential temperature and the head. If the efficiency changes over time, comparisons can be made on plots of efficiency versus head. For high-head pumps, an allowance must be made for the isentropic temperature rise, which occurs as a result of pressure increase . Commercially available devices are widely used for the thermodynamic method, especially in the water industry . For the installation of pressure and temperature probes, tappings for measuring suction and discharge must be two pipe diameters away from pump flanges. Tong-type detectors are placed to measure motor power. Pump efficiency is then found from the precise measurement of the head and temperature rise through the pump. By assessing motor losses, the power absorbed by the pump can be computed, and from these data, the pump flow can be found. For condition monitoring, tests at around the normal operating point are usually sufficient. The thermodynamic method would be more attractive economically if no special tapping points were required. Research at Monash University (Gippsland, Australia campus) on high-head pumps using special semiconductor temperature probes on the outside surface of the piping (even when covered with insulation) gave usable results, provided the pump was allowed to run at steady operating conditions for 30 min to allow the piping temperature to stabilize . The empirical expression shown below gives the percent efficiency for pumps at up to 54°C. The expression includes a correction for the isentropic temperature rise. Total head is in kPa, and temperatures are in °C . Multistage pumps with their impellers facing in one direction usually have a balance disc or drum arranged such that the final-stage discharge pressure counteracts the axial thrust on the shaft line. Another method for pump condition monitoring is to measure the leakoff from the balance device . The basis of the method is that if increased wear in the annular space of the balance device is evident from increased leakoff flow, then the interstage clearances must also be worn. Because the leakoff line is quite small compared to the pump main flow piping, a permanent flowmeter for this method is relatively inexpensive. Figure 4 shows an example of using leakoff flow to schedule pump overhauls of boiler-feed pumps at a power plant. Flows are read manually, and trends plotted using a database program. Note that here the balance flow (15 L/s) corresponds to about 10% of the regular duty flow, and consumes about 250 kW of extra power. When added to the likely internal recirculation, this would mean that an even larger proportion of the power absorbed is being wasted. The boiler-feed pumps are variable-speed units, and other tests show that the measured flows must be corrected in direct proportion to the speed. On a set of pumps of a different design at another location, both head-flow and balance flow were measured for some years, but no correlation was found between the two. On still another pump type, of the 11 stages, the head-flow performance was determined to be well below the datum curve. As the pump was dismantled, measurements showed that the interstage clearances were not worn. A condition-monitoring credibility crisis was averted when the balance seat area was reached and found to be severely eroded from water leaking past the valve seat. Balance flow had obviously been very high. For the best monitoring, it is therefore desirable that both head-flow and balance flow should be measured, particularly if the balance area can be separately dismantled in the field. The most economically cost-effective time to restore lost pump performance by overhaul varies with the circumstances. If the deterioration of pump performance is constant over time, then operators can conduct a cashflow analysis to ensure that investing in the pump overhaul will yield the required rate of return. This analysis is the same process as that used in deciding on any significant investment in plant improvement. 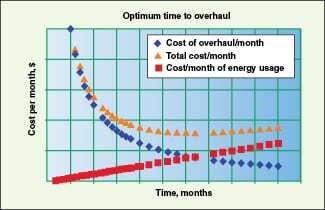 If the deterioration rate is increasing with time, then the optimum time for overhaul occurs when the accumulated cost of the increased electricity consumption equals the cost of the overhaul itself. Pumps that run intermittently to meet a demand: In a pumping installation such as topping-up a water supply tank or pumping liquid out of a tank or vessel, deterioration will result in the pump taking more time to do its duty. Therefore, the extra service time required of the pump results in increased power consumption, and that can be compared to the cost of conducting the overhaul. Pump deterioration does not affect plant production: In some cases, where a pump is operated at constant speed with throttle-valve control, a deterioration in pump performance may not affect plant performance, at least initially. The internal wear does not cause any loss in production from the plant, because the control valve can open more fully to maintain pump output. Eventually, as wear progresses over time, pump output may not be sufficient to avoid a loss of production. Or the extra power consumed will exceed the motor rating. Figure 5 shows the head-power-flow site-test characteristics of such a pump. Its output is controlled using a throttle control valve. The duty flow is 800 m³/h, and the duty point in the new condition is represented in Line A. The power absorbed by the pump is read off the power-flow curve (2,150 kW; Line B). 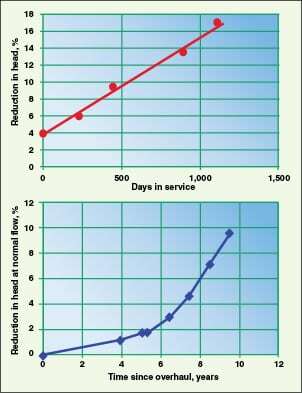 The power-flow curve should ideally be found onsite, but information from the works tests may have to suffice. After some service, the data points marked on the diagram as “Test points — worn pump” indicate that internal wear has occurred. When worn to this extent, the operating point moves to Point C (the system resistance curve moves lower when the throttle valve is opened further). The increased power required in the worn condition can be estimated by extending from the head-flow curve at constant head from the operating point to Point D, and then dropping straight down to the point where the the power-flow curve intersects for the new condition at constant flow: Point E. Next, follow the arrowed line in Figure 5. 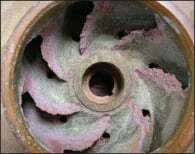 It is assumed that the original curve still represents the flow through the impellers. Less flow is leaving the pump to the system due to internal wear. (If the pump was motor-driven, it may be possible to measure the actual power by a test at extra expense). 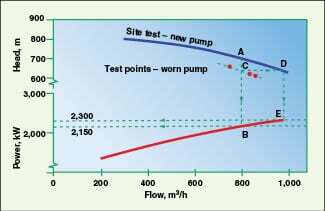 In the example, the power required for this duty in the worn condition is shown in Figure 5 by the projection from the duty flow of 800 m3/h to the test curve to find 640 m of head, then by moving across to the “site test — new pump” curve, and down to the power curve, to find 2,300 kW. The extra electricity consumption is therefore 2,300 – 2,150 = 150 kW, which is then divided by motor efficiency (90%, in this case), to obtain 167 kW of extra consumption. If the sealing clearances are known (either by previous experience of correlation with measured performance, or if the pump is opened up already), operators can estimate the extra power consumed that will likely be saved as a result of an overhaul [1, 8]. Finding the optimum time for overhaul from head-flow data. For this example (Figure 6), the test points were obtained following 24 months of service (the pump was known to be in new condition at the start). An overhaul would cost $50,000, with electricity costs of $0.10/kWh and with the pump in service for 27% of the time, on average. The increased power consumption is estimated at 167 kW (with motor efficiency included in the total). The test discussed here shows that the rate of increasing cost per month has reached 167 × 0.10 × 0.27 × 720 = $3,246/mo (using an average month as 720 h). As the time that the pump has been operating now is 24 months, $3,246 ÷ 24 gives the average monthly cost rate of deterioration as $135/mo. The optimum time for overhaul (T) is calculated  from Equation (1). where O = cost of overhaul and C = cost rate of deterioration. This calculation yields an optimum time to overhaul of the pump of 27.2 months. It is better to calculate and plot the average total cost-per-month values for a range of times. Doing so will allow the cost impact of undertaking the repairs at another time (such as at a scheduled plant shutdown), to be seen clearly. For an example, use the time period of 22 months. The average cost of conducting the overhaul is now $50,000 ÷ 22 = $2,273/mo. The average cost of extra energy consumed is then ($135 × 22) ÷ 2 = $1,485/mo. Total average cost per month is the sum of these two figures: $3,578/mo. Since pump wear progresses linearly, the cost per month also is linear and the average can be obtained by dividing by two (at the starting time, the value is zero, and the average over the time period is given by the ending value minus the start value, divided by two). Repeat this calculation for several months (the use of a spreadsheet can be helpful) and look for the minimum total cost, which is at 27.2 months. If plotted as cost per month against time, the resulting curves will show that the cost per month of overhaul drops over time, and the cost of extra energy increases with time. The time value of money could also be taken into account, if required. Usually the total cost curve is fairly flat for ±20% or so. The calculations can be easily set up using a spreadsheet. If the overhaul was delayed until the 30-month mark, for example, then the accumulated cost of lost energy would have reached $135 × 0.5 × 30² = $60,750. At 27.2 months, the cost is $135 × 0.5 × 27.2² = $49,939. The cost of delaying overhaul is thus the difference between the two ($10,811). This calculation is only correct if the wear progresses at a rate that increases uniformly with time. As Figure 3 shows, this is not unusual. Information may not be available to make any other assumption, but decision makers have to start somewhere. Other formulas apply for nonlinear rates of change . Pump deterioration does not affect production (variable-speed control): In situations where a pump has variable-speed control, and performance deterioration does not (at least initially) affect production, the following steps can be taken. For a pump where the speed is varied to meet its desired duty, the effect of wear on power required is much more dramatic than for the case of a constant-speed, throttle-controlled pump. This is because the power usage increases in proportion to the cube of the speed ratio. Unless the pump output is limited by the pump reaching its maximum speed, or by its driver reaching its highest allowable power output, then no production will be lost. However, power consumed will increase more dramatically for a given wear state than that for a constant-speed pump. To estimate the power required in the worn state, the head-flow curve must be drawn for the current higher speed in the new condition. Select a head-flow point on the original, new-condition curve, and correct it to the higher speed by multiplying the flow by the speed ratio and multiplying the head by the square of the speed ratio. Repeat this for several other points at flows above regular-duty flow to draw the new condition head-flow curve. Follow the same method and calculations as in the previous section to find the time for overhaul at minimum total cost. The operating point is projected from the worn curve to the new curve at the same speed as the worn curve. Figure 7 shows the performance of a variable-speed pump. When new, operation at 1,490 rpm meets the desired duty flow, at operating Point A, requiring 325 kW of power (Point B). After some period of service, internal leakage has increased to the extent that the pump must run at 1,660 rpm to meet the required duty (still Point A). 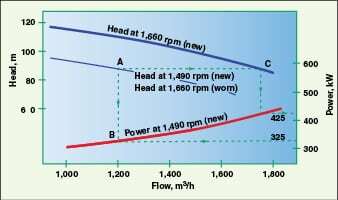 To estimate the power required now, the head-flow curve must be drawn for the higher speed in the new condition. Several head-flow points are selected and corrected to the higher speed. To do this, multiply each flow by the speed ratio, and multiply each matching head by the speed ratio squared. This will result in the head-flow curve at 1,660 rpm in the new condition. Project across from the head at the duty flow (Point A) to meet the head-flow curve at 1,660 rpm (new condition; Line C in Figure 7). Projection downward at a constant flow leads to the increased power required at 425 kW. The extra power is 31% more. (This pump is driven by a steam turbine, so power consumption cannot be measured). The same calculations as those presented in the previous section are followed to find the time to an overhaul that minimizes total cost. The shut-off head test information can also be used to estimate the power used in the worn state, and to perform the optimization calculations as explained in the above section. Head-power-flow characteristics in the “new” state are needed as before, and the operating point must be known. Note the power required at the operating point, as before. Make an overlay trace of the head-flow curve in the new condition. Place it over the “new” curve and move to the left horizontally until the curve cuts the head axis at the value of the shut-off head obtained on the test. The trace is now in the position of the “worn” head-flow curve, which is being experienced. Exactly the same process as that explained above can be followed. 1. American National Standards Institute. American National Standard for Centrifugal and Vertical Pumps for Condition Monitoring. ANSI/HI 9.6.5-2000. 2. Beebe, R.S. “Predictive maintenance of pumps using condition monitoring.” Elsevier, London. 2004. 3. Robertson, M. and others. Continuous Pump Performance Monitoring and Scheduling. IMechE Symposium — Energy Savings in Pumps and Pumping, London, 2007. 4. Beebe, R.S. Thermometric testing of high-energy pumps using pipe surface measurements. Paper presented at the 3rd ACSIM (Asia-Pacific Conference on Systems Integrity and Maintenance), September 25–27, 2002, Cairns, Australia. 5. Whillier, A. Site testing of high-lift pumps in the South African mining industry. IMechE paper C155/72, Conference on Site testing of Pumps. London, pp. 209–217. 6. Karassik, I.J. and others (Eds.). “Pump Handbook” McGraw-Hill, New York, 2001. 7. Haynes, C.J., and Fitzgerald, M.A. Scheduling Power Plant Maintenance Using Performance Data, ASME Paper 86-JPGC-Pwr-63, 1986. 8. Stepanoff, A.J. “Centrifugal And Axial Flow Pumps.” John Wiley & Sons. Hoboken, N.J. 1957, and Figure 1-77A of the PDF figures found at www.pumps.org. Ray Beebe (Phone: +61-408-178-261; Email: ray.beebe@monash.edu) works part-time since retiring after a 20-year tenure as a senior university engineering lecturer at Monash University (Gippsland campus, Victoria, Australia) and an engineering consultant with 28 years of experience in the power generation industry. His commitment to sharing knowledge and experience has led to writing and presenting at many conferences and conducting training courses in condition monitoring around the world. His second book gained the George Julius Medal of Engineers Australia for the best publication in mechanical engineering in 2004. His third book, on condition monitoring of steam turbines will be published later this year. He is an active volunteer in rotary and scouting. Beebe received a diploma of mechanical engineering from the Caulfield Institute of Technology, and an M.S. in engineering science from Monash University.